With more than 20 restaurants and more than 15 hotels around the world, chef Nobuyuki “Nobu” Matsuhisa has built a culinary and hospitality empire that’s boosted him to celebrity status. He is known for his fusion cuisine that marries Peruvian ingredients into Japanese dishes. 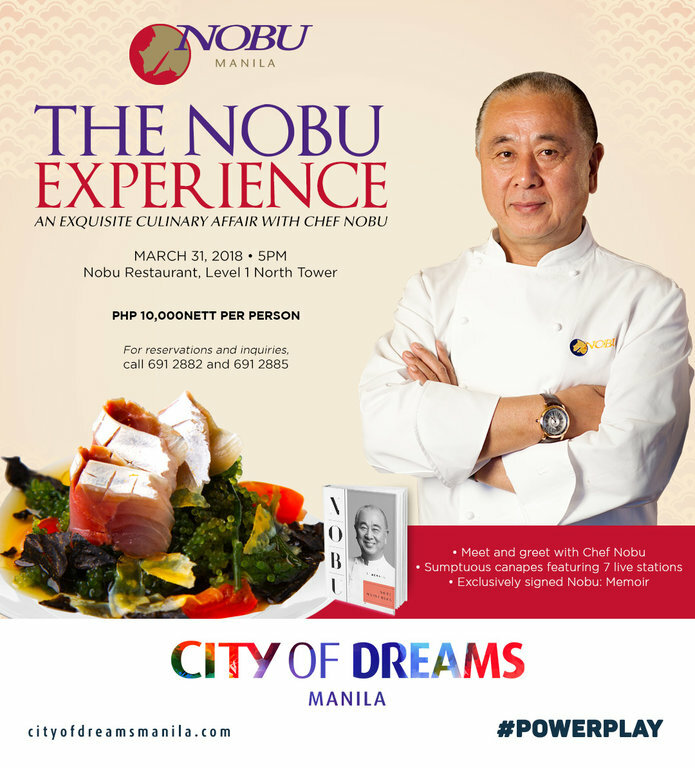 Chef Nobu will be hosting a dinner at Nobu Manila, City of Dreams on Mar. 31. The dinner, aptly called “The Nobu Experience” will give guests the chance to try dishes made by the chef himself, as well as have a meet-and-greet and photo op with him. A bonus: After feasting and chatting up the chef, you get to go home with a signed copy of chef Nobu’s book, “Nobu: A Memoir,” too. Some of the dishes that chef Nobu, along with Nobu Manila’s chefs, will be serving for the special dinner include hors d’oeuvres such as Japanese yellowtail sashimi with jalapeño and bigeye tuna sashimi salad skewers in Matsuhisa dressing, canapés like Nobu mini tacos, mixed seafood ceviche with quinoa, and umami chicken wings with sweet soy anticucho. There will also be a carving station serving Nobu-style wagyu pastrami sliders, and a robatayaki (fireside-cooking over hot charcoal) station with kushiyaki and grilled meat. Of course, a Japanese dinner can’t go without sushi. Nobu specialties like sake cup sushi, Japanese uni shooter sake and ponzu, and Manila prawn cocktails will also be available. There will also be a variety of Japanese-inspired desserts at the end of the dinner. So just how much is this dinner? The Nobu Experience costs P10,000 net per person, including the meet-and-greet, photo op, and signed book. For reservations, guests can contact City of Dreams Manila via email at guestservices@cod-manila.com, or visit their website.